Oil dewaxing, also called winterization, is typically used at corn and sunflower-processing vegetable oil refineries. It improves the oil's clarity and brightness by removing solids—saturated glycerides or waxes—that are visible at ambient or low temperatures. KMEC's oil dewaxing machinery reduces the content of these solids to less than 10 parts per million, a level necessary for proper stability. 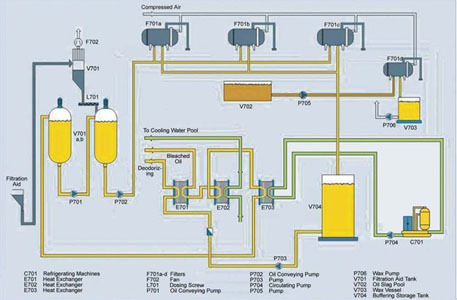 All vegetable oil refineries operate on the same basic principles. The crude oil obtained either from an expeller or solvent extraction plant contains impurities which must be removed for the oil to be edible, more palatable and stable for storage. The process of removing these impurities is called refining. KMEC performs turnkey projects for vegetable oil refineries. Our technical knowledge and experience sets us apart from the competition. Many of our projects have been undertaken overseas, granting us a large base of international clientele. Our clients' interests are at the top of our priority list.